The above were all small items found in two box lots at the same estate sale except for the Roanoid Ashtrays which I highlighted in the previous post. Among the treasures are a watch shaped compact, several lipstick holders, a really cute MOP address holder, a matching tube lighter and liptstick holder with fake gem on the top, an articulated fish key chain, some purse ashtrays and some pill boxes, 2 gold coloured salters, a horn spoon, and a small signed enameled dish. There were also 3 demi tasse cups and saucers all in excellent shape, made in Germany or Bavaria. The previous owner of these items was really into miniatures and I had to stop myself from buying more at the sale as I also love anything in miniature. This is a relatively small sample of the types of Pie Birds that are out there just waiting to be discovered by avid collectors. The black and white ones are fairly common. They were made in many countries and in many different shapes but the bird is the most recognizable one. The pink and yellow ones pictured are Josef Originals made in Japan in the mid 50’s. I have had some really cute ones but alas, I sold them. Now that I am collecting them for myself I hardly ever see anything other than the black ones. 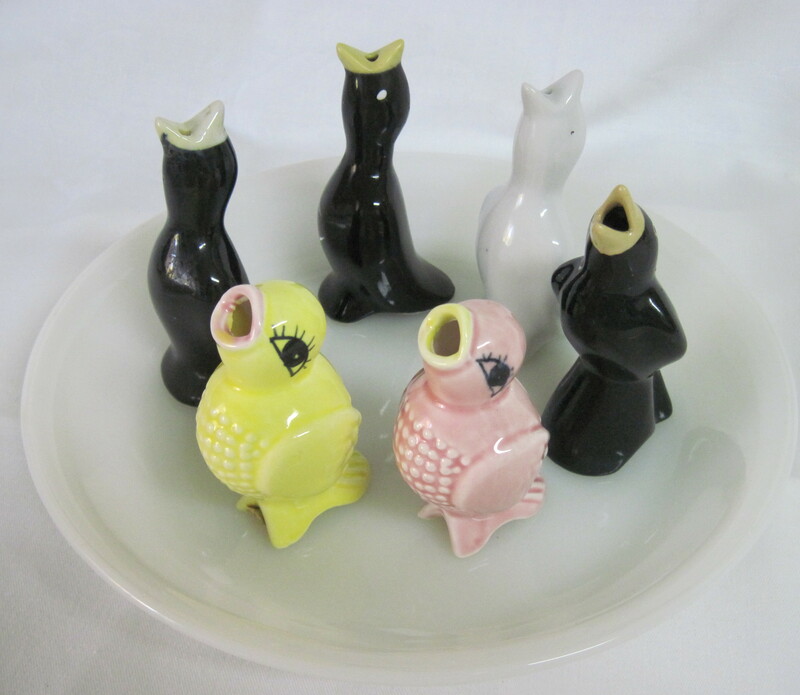 If you want to check out the variety of pie birds available, check out this site: http://www.piebird.net. For those of you who are not familiar with pie birds, they are used to vent the steam in a pie baking in the oven which helps to prevent the filling from boiling over. You place a bird on the bottom pie crust, place the filling around it and fit the top crust around the bird. This is another collection of mine that resides on a corner shelf in my kitchen. 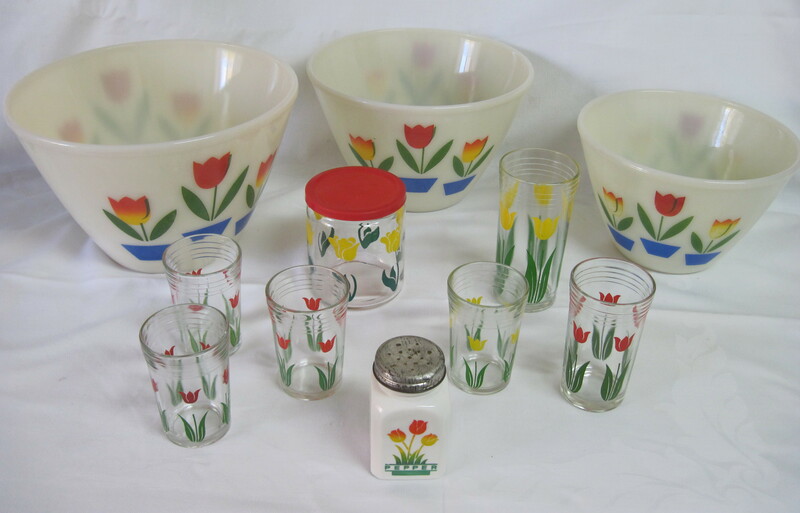 The Fire King Splash Proof Tulip Mixing Bowls were made by Anchor Hocking around the 50’s. The shape of the bowls reduces splashes when mixing, hence the term Splash Proof. The tulip glasses are called ‘Swankyswigs’ and these particular ones were made in the 1950’s. They originally contained Kraft Cheese Spread and they were marketed as a collectable drinking glass. They came in many sizes, colours and patterns. The milk glass tulip shaker is made by Hocking Glass also ca. 1950’s. Glass storage container with tulips and red plastic lid manufacturer is unknown but from the same era. My family always laugh when I say this, but tulip themed items are ‘Highly Collectable”. Who knew brown could be so pretty? The porcelain plate and urn were manufactured by H.K. Tunstall around the 1930’s when Art Deco was all the rage. 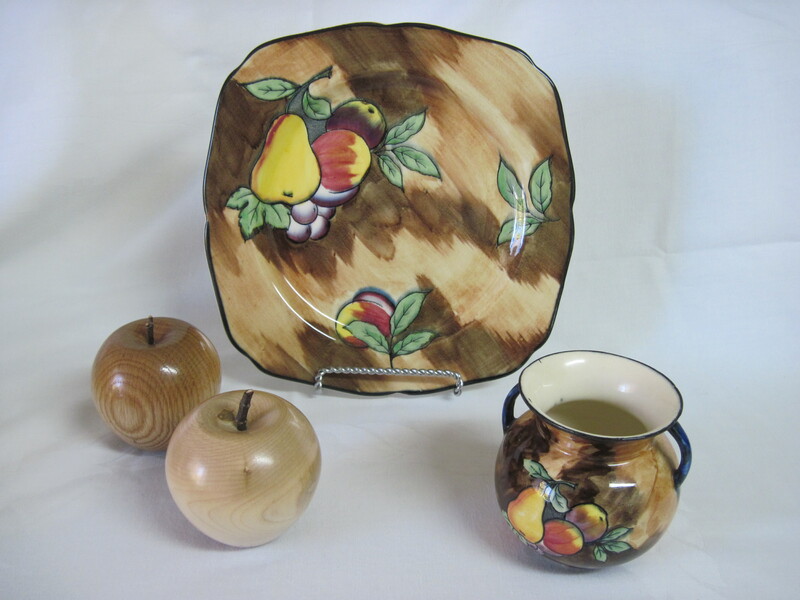 The hand painted pattern of apples and pears is called Luscious. There were 14 different hand painted designs in the Luscious series. These dishes are becoming quite expensive to buy so for now I have a collection consisting of two pieces until I come across some at a decent price. The hand crafted wood apples were a gift from my son from his recent travel to NFLD this summer. I thought they fit in beautifully with the dishes. 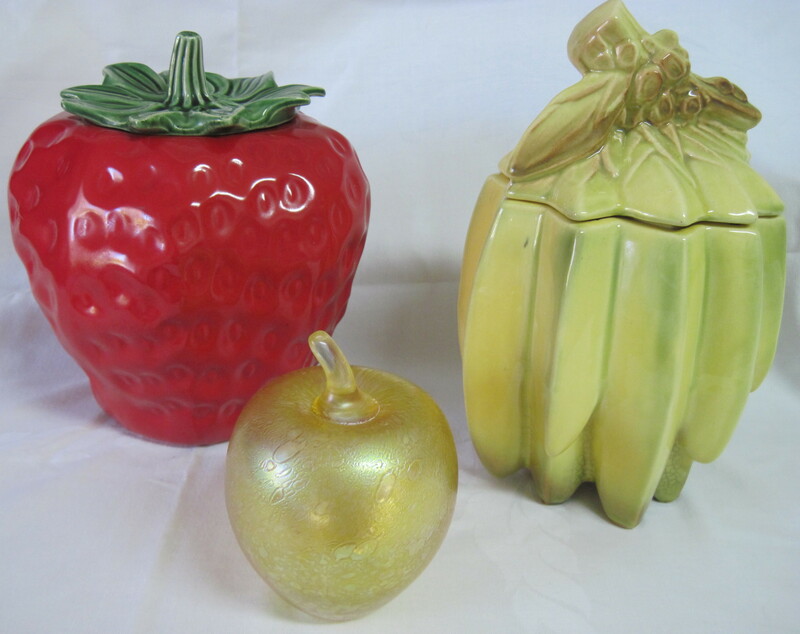 Below are two lovely cookie jars that caught my fancy and fit in with my fruit and vegetables collections. The strawberry is made by McCoy and is the real deal. It has an embossed number on the bottom. The banana cookie jar is a reproduction of the orignal McCoy Banana one. You can tell it is a repro by the finish, which has faked crazing (crazing is small crack lines in the glazing which occurs naturally over many years on some pottery). I bought it knowing it was a repro because I liked it. I photographed it with the glass apple for size comparison. 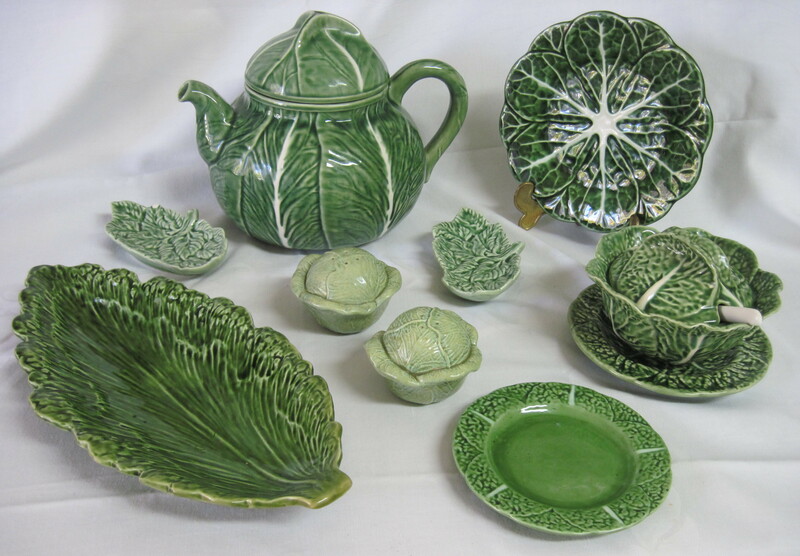 From my collection, these are some of the cabbage pieces that I have picked up over the years. I especially love my cabbage tea pot which I won at an auction and paid a mere $8 for, which was a steal. Some pieces were made by Bordallo Pinheiro Pottery Company in Portugal and some by Faiancas Belo in Portugal. There is a long serving dish by Sarreguemines in France which dates to the early part of the 1900’s. Most of the pieces would be early 1900’s up to mid century. The shakers are more recent, probably Japan in the 60’s.